Hanoi is not only the most attractive destinations for tourists but also the capital of tradition, we caught a lot of specialties of all regions converge in here, from typical dishes such as “Pho” with chicken or beef, “xoi” with various ingredients or “nem chua” – a significant dish from Thanh Hoa. 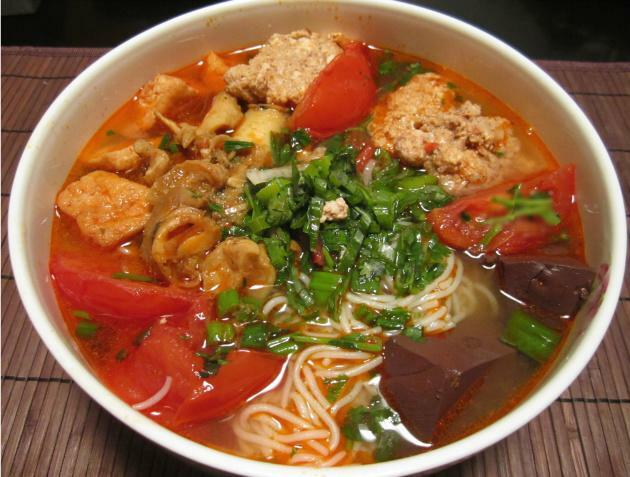 Hanoi is the convergence of local people, bringing culinary specialties of the various regions. This major exchanges made culinary culture of Hanoi more diversity and plentiful. 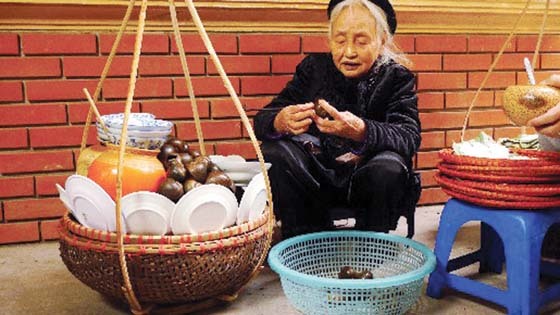 During the tour of Hanoi, travelers always have time to wander the old town or visit the neighborhood where the hotel is close to his residence, could also caught some restaurants or vendors with bun oc unique flavor. Bun oc is basically typical dish of Hanoi with the combination of sweet, sour and great taste. From rice vermicelli, add a little spicy chili, blending the greasy taste of each snail, greasy of tofu, you can experience a unique and separated flavor of this dish. In fact, “bun oc” and “Pho” have both the same and difference. “Pho” is the traditional cuisine of Hanoi in individually, Vietnam in general, with the long time of existence. “Bun” and “Pho” are made from rice, featuring the flavor of culture. One of the most important thing is broth, using in both “Pho” and “Bun”. However, “bun” provides more choices for customers than “Pho”, with various ingredients: Chicken, beef, snail. Enjoying a full bowl of “bun oc”, customers are not only experiencing the basic or traditional flavor but also green banana, a handful of chopped raw vegetables, bean sprout, tomatoes and others ingredients. These ingredients are the secrets attracting all customers. “Bun oc” also has many kinds: Cold, or adding some ingredients, like crab, green banana. Across the streets of Hanoi, you can easily find places to enjoy this delicious dish. Imaging a cold day in Hanoi, you enjoy a bowl of “bun oc”, with mildly sour of “dam bong” (fermented rice vinegar), spicy of chilli, What a wonderful taste! What makes this dish is the soul of typical dish is the balanced combination, with slightly sour, moderately salty, ginger, spicy. A plate of white rice noodles served with a full bowl of snail (processed carefully) make you enjoy it constantly without hesitation. “Bun rieu cua oc” is tasty when served hot. With delicious snails, sweetness of crab, the broth, sour taste of vinegar, tomato, shrimp paste created a masterpiece in the simple bowl. If you prefer spicy, adding chilli sauce for more. With this tasty noodles, all ingredients blend together, featuring the attraction of this wonderful dish. 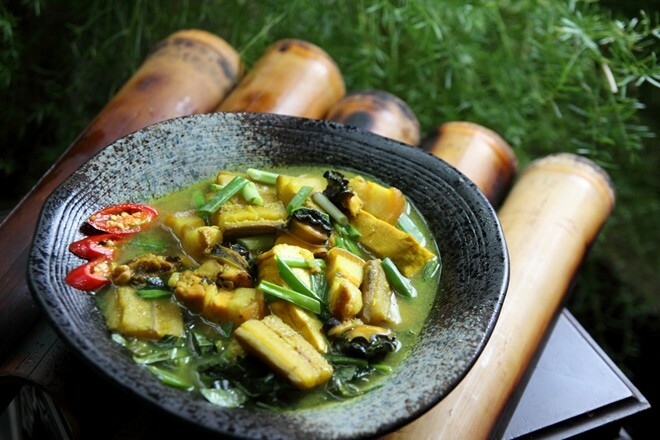 The way of cooking this dish also represents a part of the traditional culinary of Vietnam, though rustic flavor that still have a strange charm, appealing customer with such mysterious flavor. In Hanoi, “bun oc” is probably the tasty dish and familiar breakfast. 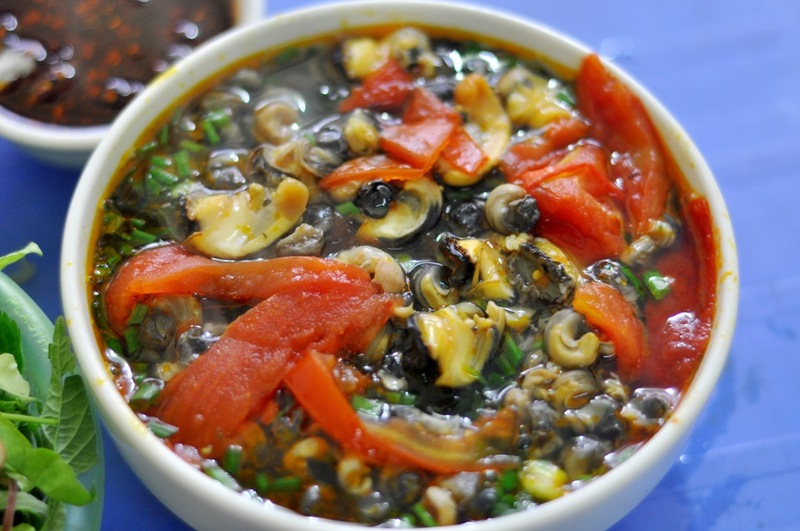 A bowl of “oc chuoi dau” attracts customer with the quality of ingredients, brightly colored, red tomato, purple of snail, green banana. When you enjoy it, the flavor is melting in your mouth, along with greasy, spicy, sweet and sour. Adding some vegetables and sliced ​​bananas, served with chilli, you can experience the ideal Hanoi feature in a winter day. A delicious noodle bowl is the combination of all nuts, spices, lemon, star fruit, vinegar. Especially, in the noodle broth to make people enjoy unforgettable moment. The broth used from the boiled snail, adding tomatoes, fermented vinegar. You should prepare minced green onion and “tia to” to be more attractive. 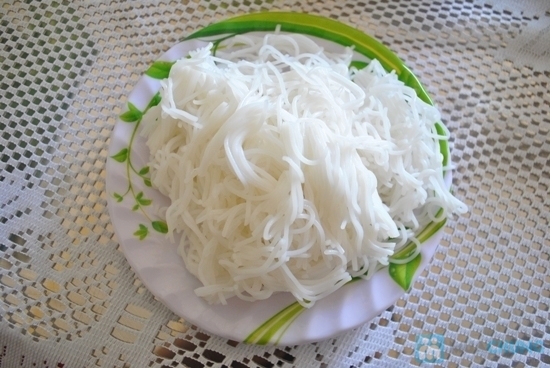 Put rice vermicelli in the bowl, pouring the broth and enjoy. The completed “bun oc” is served with chilli, vegetable and bean sprouts.